As the weather warms up more and more insects and creatures seem to be appearing from their winter hiding places. Yesterday there were quite a few butterflies in a garden I was visiting. This made me think about a really good attraction for butterflies in the summer garden – that is the ‘butterfly bush’ or Buddleja which can be planted now for summer colour. The most common of the Buddleja is B.davidii – this is the true butterfly bush that attracts butterflies from every corner of the garden to its fragrant flowers. There’s quite a collection of Buddleja, from the usual ‘Royal Red’ with dark red flowers and ‘Black Knight’ with it’s dark purple flowers to the more unusual ‘Harlequin’ with variegated foliage and ‘Peace’ with white flowers with orange centers. I haven’t yet come across anyone who doesn’t like Buddlejas. Perhaps it’s because they are easy to grow, easy to propagate and have a graceful appeal about them. You can buy a Buddleja at the garden center, plant it in the garden and you’ll know it will do virtually what it says on the ticket. Another advantage is that they are easy to maintain – prune them once a year in the spring down to four buds or so from the base and they grow again. Butterflies are attracted to the Buddleja as if by magic, I am however told that adult butterflies like blue flowers and so that makes B.davidii ‘Empire Blue’ and ‘Nanho Blue’ strong candidates for a butterfly garden. If you deadhead Buddleja then they often give a second flush of flowers late in the year. 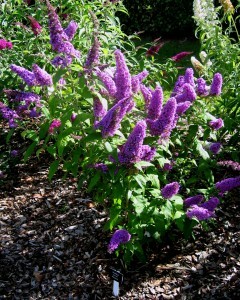 Planting three or more Buddleja in a group is a good idea as you then get a very bold statement. They grow quite quickly reaching 2.5m in about three years so this makes them idea for the backs of borders or for including in a screening project along with other plants. They are admittedly more cottage type plants and look good with free-flowing planting although with careful planning they can be sneaked into more modern schemes for those arching branches of flowers. Another use for them is to line a path edge (if you have a large garden that is), place the plants one every 6’ or so and then you can create a screen that appears every year giving a different feel and views into a garden. Care of the Buddleja davidii is easy. Apart from the simple pruning, they benefit from an application of a rose type fertilizer (potash) in mid spring and summer. A mulch as always is very useful and is best done in autumn when the ground is still warm and moist. Other than that quite easy and very pest-free too! Now is the time to buy a Buddleja or two and plant them in your garden for summer colour. If you already have some established Buddleja then give them a trim back if necessary and give them a feed to help them give a good display this year.